LA… we teased you last week and now the day is finally here. We are officially bringing our best development to date, Beyond Sausage, to our hometown! Starting today, Angelenos across the city can enjoy the juicy satisfaction of Beyond Sausage at Veggie Grill's El Segundo & Hollywood locations, as well as Wurstküche's DTLA and Venice locations. 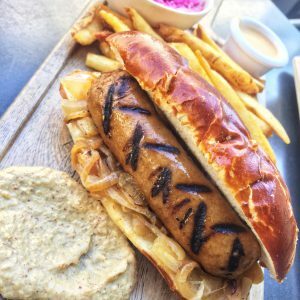 An LA favorite, fans at Veggie Grill can enjoy the Wunderbrat: A Beyond Sausage Original Bratwurst served on a Pretzilla bun with Sierra Nevada cheese sauce, caramelized onions, mustard, pickled red cabbage, and crispy fries. Wurstküche, whose name is synonymous with sausage in LA, will be the only restaurant in LA serving up all three of Beyond Sausage's irresistible flavors: Original Bratwurst, Hot Italian and Sweet Italian. This sausage savant will feature the Beyond Sausage in the butcher case alongside their meaty counterparts and will be available for consumers to build-their-own creations, choosing from a selection of toppings and sauces. 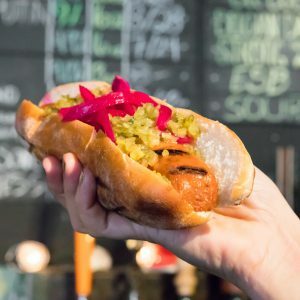 "We already had an existing vegetarian option on the menu but its taste, texture and appearance didn't come close to that of Beyond Sausage or delivering against traditional pork sausage," said Wurstküche founder and co-owner Tyler Wilson. "Beyond Sausage is a game-changer and the first of its kind; we think our customers will be blown away when they try it." Beyond Sausage promises to deliver on the taste, texture, and look of a pork sausage but with less saturated and total fat. It truly is the first of it's kind, with no GMOs, soy or gluten, and we can't wait for more people to try it! Beyond Sausage will continue to pop up around the country so be sure to follow us on social or subscribe to our newsletter (here) to be the first to know where Beyond Sausage is headed next! And in case you missed it, we debuted it in Boulder this past December and in New York earlier this month.